While only a handful of states issue “Landscaping Licenses,” the majority of states do have a specialty contractor classification for landscapers. Construction is one of the most heavily regulated industries in the United States, and this is no less the case for landscaping contractors. Each state, county and municipality has unique licensing laws relating to landscapers. All states have a strong interest in regulating landscaping contractors in order to protect consumers and because of the inherently dangerous nature of the work. Typically, licensing requirements seek to reduce the risk of harm by creating minimum standards of competency and insurance coverage. To obtain a landscaping contractor license, you are often required to demonstrate experience and ability through examination, references, or both. Furthermore, you may be required to provide a surety bond, proof of insurance, and/or documentation demonstrating financial stability. State and local governments are always revamping efforts to prevent the operation of unlicensed contractors, landscapers or otherwise. In fact, in June 2013, twelve unlicensed contractors in Merced County, CA were caught in a sting operation conducted by state investigators. Unlicensed landscapers may face harsh civil and criminal penalties, ranging from fines to imprisonment. 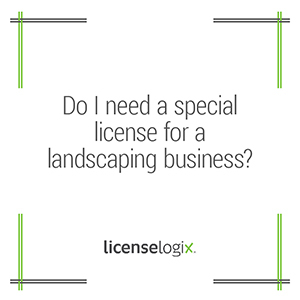 This is why it is important to let LicenseLogix manage the process of obtaining your landscaping business license. LicenseLogix can help you obtain all the licenses and registrationsyou need, as well as perform business license research, and manage your ongoing license renewals. For additional help you can click contact us, or give us a call at (800) 292-0909.